The progressing roll out of fixed and mobile Internet access has paved the way for seamless all-IP applications, thus creating a demand for the Future Internet (FI). This is why we address FI issues as part of our research activities. In the last decade Next Generation Network (NGN) and Next Generation Mobile Network research (more information available at the FOKUS FUSECO Playground) has been a major focus of R&D activities in telecommunications globally. Most notably, interworking with and migration from fixed and mobile legacy telecommunication networks as a step towards the NGN/Next Generation Mobile Network model has been a major challenge. Many ongoing research activities concentrate on NGN security, emergency support, management and the integration of NGNs into advanced Service Oriented Architecture (SOA) based Service Delivery Platforms (SDPs) for the provision of revenue generating multimedia applications. However, NGNs and SDPs are currently being deployed all around the world and related NGN and SDP testbeds are helping to make these new technologies and their potentialities more understandable. From an R&D point of view, the next big challenge is coming into view; the NGN evolution towards the Future Internet. While the telecommunications world has looked at NGN research and on the impact of Internet technologies and rich applications, the Internet community has started to investigate how the Internet is evolving to meet the new user demands created by innovative Internet applications. While many FI researchers have looked for a disruptive approach, also known as a clean slate design approach, in which the classic layered network protocol stack is replaced by a dynamic programmable cross layer protocol stack, nowadays an increasing number of researchers are also investigating an evolutionary approach from the NGN. This is motivated by a desire to maximize the reuse of the ongoing NGN investments and to enable a smooth transition from the existing converged network ecosystem into an open services market environment. Here at FOKUS we are in the unique situation of having experts performing FI research in both of these directions. The former FOKUS competence center Network Research (NET) has a long tradition in FI research, and has been particularly recognized as a pioneer in the field of Autonomic Communications (AC). On the other hand, researchers from the competence center Next Generation Network Infrastructures (NGNI) have become internationally recognized as NGN testbed experts, particularly in the field of service-oriented SDP technologies over mobile and fixed NGNs for rich communications and multimedia applications. Since 2011 the NET group has been merged into the competence center NGNI to maximise the synergies of these expertise domains leading to our newest testbed referred to as NGN2FI Evolution lab in which we develop and validate NGN2FI interworking and migration scenarios. In addition, FOKUS is active in many international research projects under the banner of the European Commission’s Future Internet Research and Experimentation (FIRE) research framework and is investigating FI monitoring, security and management, as well as innovative multi-service and end system architectures. 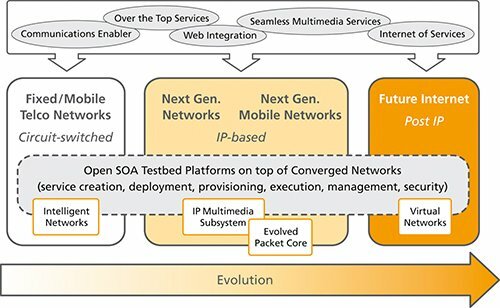 Here in NGNs and the FI the notion of dynamic service overlays is an important concept, starting from structured and centralized overlay architectures, like the IP Multimedia Subsystem (IMS), to more distributed ones like Peer-to-Peer (P2P), Over-The-Top (OTT) architectures, and Next Generation Service Overlay Networks (NGSON). With the global availability of fixed and mobile broadband Internet access, new and innovative Internet applications are emerging that render communication itself a commodity and classic telecommunication business models are ceasing to work as a result. In the context of this research field, we currently investigate large scale Cloud Computing in NGNs. AV is the chair for Next Generation Networks at Technische Universität.